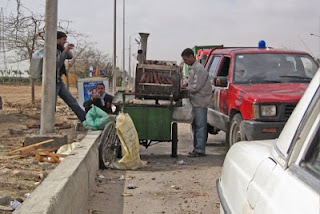 Seeing smoke on a street anywhere in Egypt is no cause for alarm. 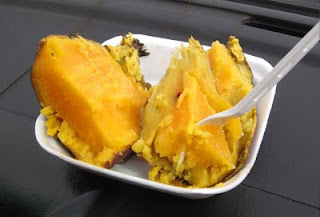 It is probably just a sweet-potato vendor roasting his product. 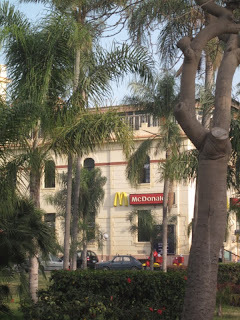 These fast food servers are found downtown, in tourist areas or even along the side of major roads. 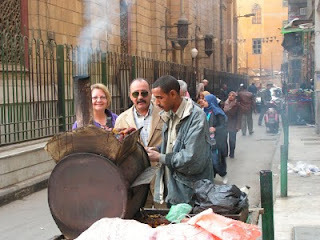 Here is one near the Khan el Khalili bazaar. And another alongside the road to October 6 City where we pulled over today for a quick snack. The results are uniformly delicious. 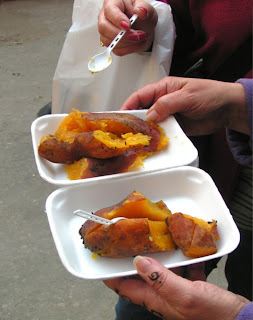 Served with butter and salted to taste they make a tasty afternoon snack or lunch for two or three Egyptian pounds, about fifty cents, U.S.
At the eastern end of the Corniche in Alexandria lie the Montazah Gardens. 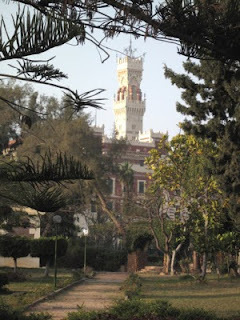 These gardens surround Montazah palace, the palace of King Farouk. Farouk was the last king of Egypt and was overthrown in 1952. If you want to pick up just a bit of why Middle-Eastern affairs are complicated, read the story of Farouk and the revolution. As you approach the gardens and palace, it seems a bit like entering Disneyland. 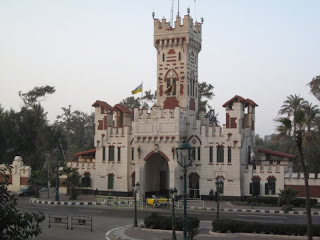 Here is the main gate. The gardens surrounding the palace form a wonderful park. It is easy to spend a couple of hours strolling through the area, perhaps ending up at the king's private harbor. 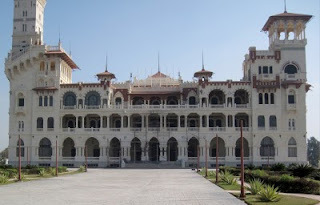 The entrance leads to a long road lined with palms that guide you in the general direction of the palace. and then the entire building. Strolling elsewhere in the gardens leads past many flowers and you might end up at the clock tower. 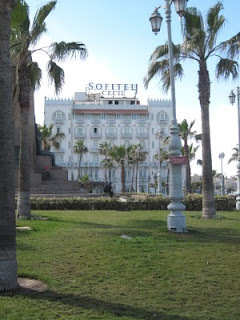 We had lunch at a nearby Egyptian restaurant on the grounds and then returned to the Corniche. 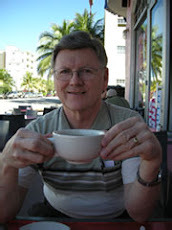 There we walked for a mile or so before pausing at a sidewalk coffee shop where we watched the sun set. 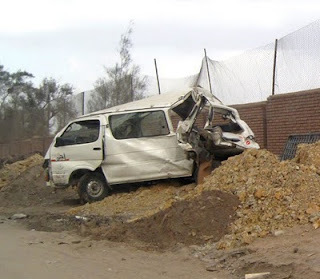 The results of the hailstorm from three days ago were still visible today alongside the road from the Pyramids to October 6 City where these two vehicles had been involved in a crash. 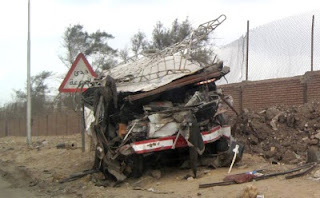 The vehicle carcasses remained alongside the road. It appeared that the smaller van-like local bus on the left had been rear-ended by the larger bus on the right. That thunder and lightning I posted about the other night got everyone's attention. Four people were killed and more than 50 hurt as bad weather wreaked havoc across Egypt, pelting the capital with a freak hail storm and smashing a luxury liner into a pier, officials and media said Friday. 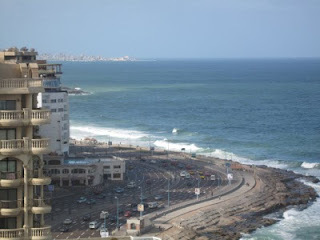 In the northern Mediterranean city of Alexandria, waves as high as a two-storey building pounded the coast, media reports said. 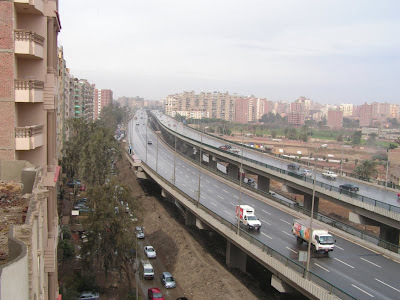 Thursday evening’s hail storm in Cairo, the first in many years, caused mayhem in the capital, snarling traffic and bringing the sprawling city to a virtual standstill. 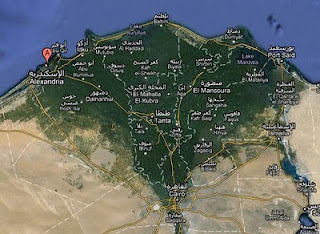 Maybe it was good that we had returned from Alexandria early Thursday morning! Local folks had varying experiences. Some thought it might be the end of the world. On the other hand, that AFP report said, "Tourists near the Giza Pyramids, on the outskirts of the capital, ducked for cover from the frozen, marble-sized pellets." 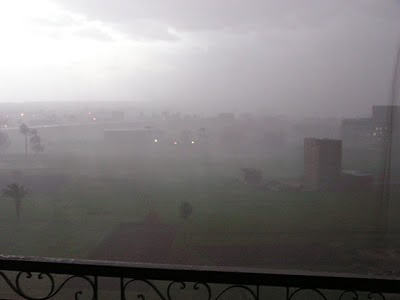 We also heard that locals near the pyramids were running out to catch some hailstones. 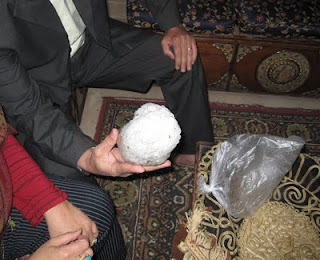 In fact, one of our friends living near the pyramids gathered up a bag of hailstones and put them in his freezer. Many people thought that they had experienced snow. Some of them thought we had brought the snow here. Fortunately, we have an English-Arabic dictionary that contains the word for hail, (barad.) We explained that snow is very gentle. Photographed the hail and attributed it to "climate change." Tweeted a picture and found other religious significance. Reported the event as Global Weirding. Yesterday, Linda found a fashion channel from the free channels on NileSat to add to our "favorites." The channel was "coming and going," "breaking up," or "pixelating" - depending on your familiarity with direct broadcast television technology. I figured it might be time to refine the aiming of the dish again. I originally posted about HotBird last year. 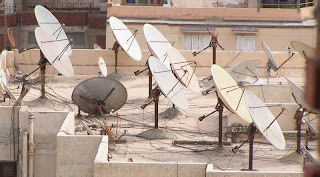 Then about re-aiming to NileSat in January. 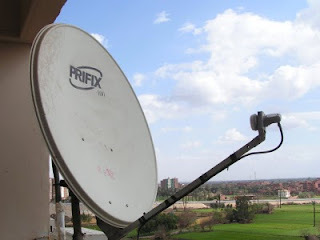 When I made the change to NileSat, I only re-aimed the dish, I didn't alter the orientation of the LNB. 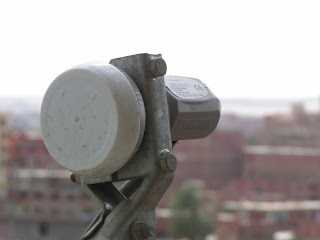 Satellite signals are strongly polarized so the LNB on the ground must be oriented to the correct angle to match the transmitter on the satellite. Here's a picture: The LNB is the little "doodad" on the end of the pole. Closeup on the right. Loosening the nuts on the LNB bracket lets you twist it. I moved it about twenty degrees and boosted my "Q" or quality on the channel meter from a marginal 50 into the upper 70s. We have much more reliable reception on all channels now. 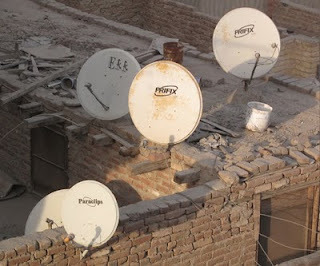 And while we're at it, here are another couple of pictures of dish farms on building rooftops. 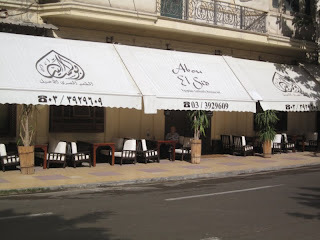 We're back in Cairo, today, after our very pleasant stay in Alexandria. We awoke this morning to a surprise. Wet streets! I've mentioned before that a few drops of rain on the balcony railing was the extent of precipitation we experience here last winter. Although it rained lightly a couple of times earlier this winter, it was barely enough to form puddles. This morning, a fairly steady light rain left the roads wet. 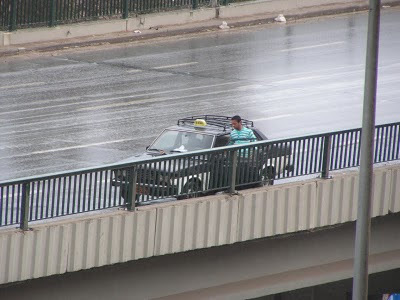 As the rain continued to fall, this taxi driver pulled over to wipe off his windshield. Perhaps the wipers don't work? After the rain, the sun came out and we had a beautifully clear afternoon. The visibility was as good as I have ever seen here. I could easily see the hills out in the desert beyond the edge of the city. This is just what I've wanted all winter, a nice rain to wash the dust off the palm trees and clear the air. At about 5:00 p.m., though, clouds returned. Thunder rumbled in the distance. The sky began to take on a definite mid-western U.S. appearance. 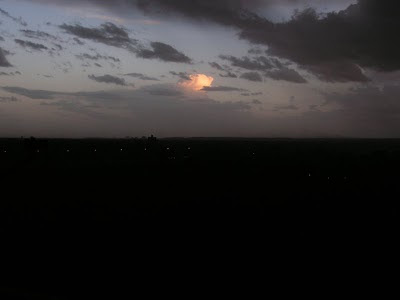 Soon, there were flashes of lightning, followed by rain. Then - "ding," "ding," "clang!" Hailstones were hitting the various satellite dishes! 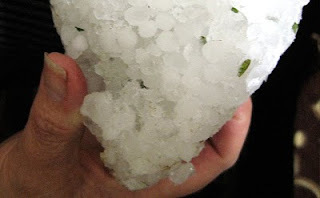 We actually had several "pea to dime-sized" hailstones on the balcony. Where is WCCO when you need it? The rain hit hard at about the same time. As I write this at a quarter to seven, the rain is still falling (gently.) The wind is howling. The temperature had fallen to 43 degrees (F.) but has rebounded to 47. And is tha more thunder that I hear? 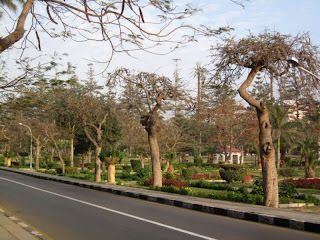 I guess that today was winter in Cairo. After looking for Old Alexandria during much of the afternoon, we headed back to the harbor. 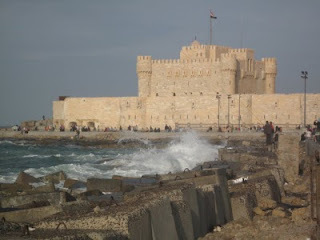 Fort Qaitbey dates from the 1400s and is a major tourist attraction out at the western end of the Corniche. We found a taxi, got in, and I said, "Fort Qaitbey." The driver nodded and headed up to the next intersection where he stopped by a group of locals. "Ingleesy?" he shouted, indicating that he needed an English translator. One of the fellows came over to the taxi. 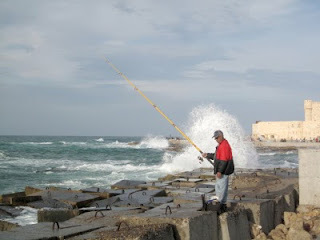 I repeated, "Fort Qaitbey," to the helper. He replied to me, "Qaitbey?" He then said "Qaitbey" to the driver. The driver then said "Qaitbey!" nodding with understanding. We were off. I obviously have not learned to properly swallow my "Q"s. There are several sounds in Arabic that I cannot make in an understandable way. In particular, there are two Arabic letters that we commonly represent with the English letters K and Q. My efforts to make these sounds just don't make the grade sometimes. 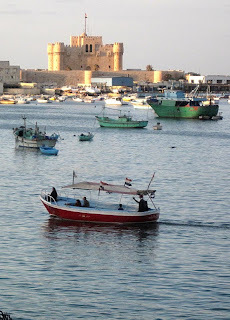 Fort Qaitbey looks like this from across the harbor. And once you arrive, the view of the Mediterranean is very nice. It's another good place to just sit and watch the fishermen for a while. The view back along the bay is also pleasant. 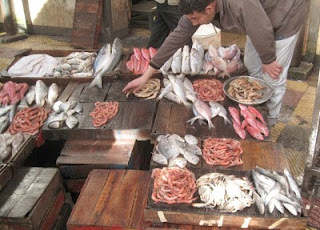 We came back the next day to explore the fish market. And to walk this section of the Corniche. The harbor view offers lots of photo opportunities. 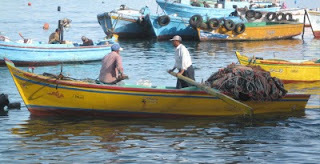 The fishing boats were in for the afternoon. 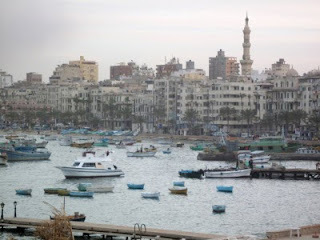 And the view of the harbor from the Qaitbey area is spectacular. 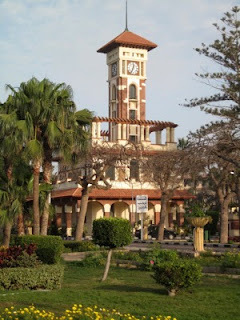 One of the prominent attractions of Alexandria is the library. 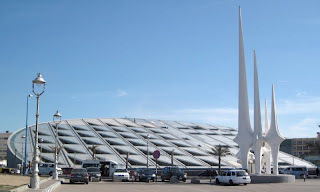 The modern library of Alexandria was completed in 2002 at a cost of about $220 million dollars. 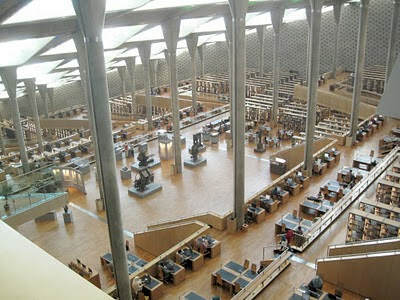 The inspiration was the ancient library of Alexandria. Apparently, actual dates for both construction and destruction of the original are a matter of some historical dispute. Destruction was around 400 A.D. and there is some evidence a Caesar was involved. The $220 million in funds was largely donated by other countries with Saddam Hussein's $21-million check reportedly clearing just days before the Gulf War. At any rate, the modern library is quite an architectural work. See the maps on the previous post to locate it. We took a taxi over for a good look today. Coming from the Corniche side of the building, we finally found a tiny sign marking the "main entrance" and were asked if we had our tickets. No, we thought we were doing good to find an entrance. It took a bit of doing to find the ticket window, "behind the statue, around the corner!" The price of a ticket was ten pounds Egyptian, about $1.60 No purses allowed but "you may want to keep your money," read the sign. The security check was quite thorough. Normally, in Egypt, westerners can just keep walking when the metal detectors sound. The security people only check the Middle-Eastern looking folks. They've got this profiling thing down! Today, I was actually asked to place my camera, cellphone, etc. on a tray and pass through the detector. Of course, I set off the alarm. The portable scanner was called into play and spotted metal in my shirt pocket. Sure enough, a wood screw. (an upcoming post, I promise!) Credit cards in my wallet too! Wow, these people are serious. We finally got inside. The view from the top floor is pretty dramatic. That is an exhibit of printing press technology near the center of the photo. There were lots of empty desks among the 2000 in the reading room and lots of empty shelves with only 500,000 books so far in the planned 8,000,000. 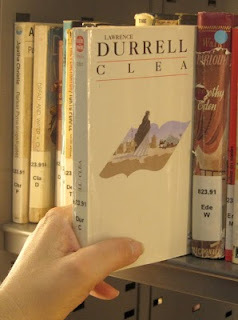 Now that I know about "The Alexander Quartet" by Durrell, I naturally checked to see if a copy of those books were here. I only found the fourth volume, Clea, on the shelf. Justine, Balthazar and Mountolive were nowhere to be found. I then checked the American literature section for one of my favorite works of fiction. But, wait a minute. 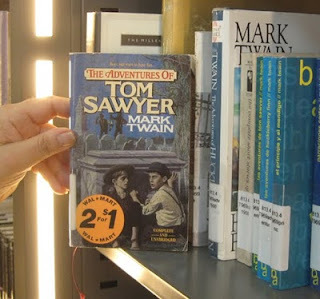 What is that sticker at the bottom of Mark Twain's classic? Well, it is an American classic so what better place to have found it. There must be an interesting story that goes with this. We checked to see if we could donate books easily and it appears that we can. So perhaps on future trips we can help edge the book count closer to 8,000,000. 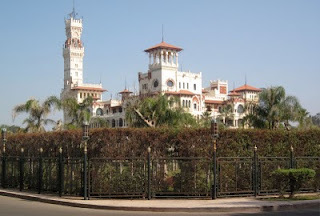 By Egyptian standards Alexandria is not an old city. Alexander the Great founded the city in 331, B.C. This Greek heritage is still visible in places. Ancient Alexandria was a center for the study of mathematics, geography and astronomy with Euclid and Ptolemy playing prominent roles. It held the world's largest library at that time. 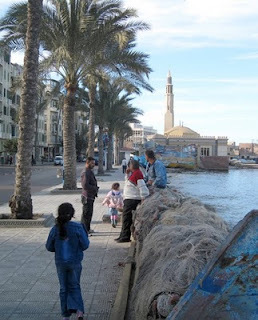 From the earliest days, Alexandria was a seaport and retains the distinction of being Egypt's largest port today with a thriving container operation. It held one of the seven wonders of the ancient world in the form of the Lighthouse. In more recent times. 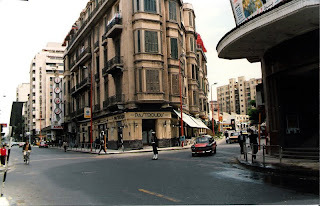 Alexandria was known for a literary community that included English novelist, E. M. Forster; Greek poet Constantine Cavafy and the British/Cosmopolitan Lawrence Durrell. The latter wrote a series of four novels set in 1930s called the Alexandria Quartet that served to memorialize "the decadent atmosphere" of this seaport. Well, with that description in the guidebook, I placed a copy of Durrell's "Justine" on order at Amazon.com and prepared to head for the writers' haunts in the downtown area. We were seeking the literary Alexandria. 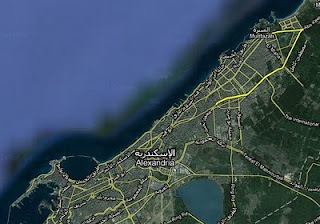 Just to refresh the geography: Alexandria is located here, on the Mediterranean. 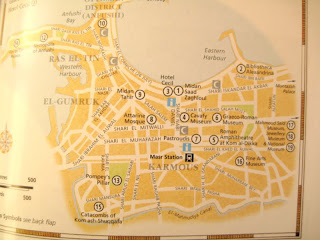 The twelve miles of Corniche along the sea is shown on this map on the left. 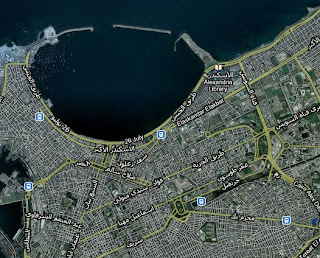 We are interested today in the old port area - that circular area at the very lower left corner. Here is a closer look on the right. You can see the area from the apartment. It is that strip of land on the horizon. We also have a guidebook map to point out the highlights. We first headed out to the Hotel Cecil. This old building was the hub of activity in the 1930s and is well preserved. It hosted Winston Churchill among other luminaries. From the Cecil, we walked South, looking for the restaurant, Pastroudis. A writer's hangout, this place had been around since the 1920s. Alas, Pastroudis is no more. 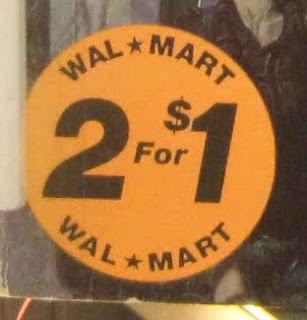 So I had to settle for this photo from the world-wide-web taken by someone back in 2006 before it closed its doors. The building is still there. But as this blogger laments, "no one thought to save it!" 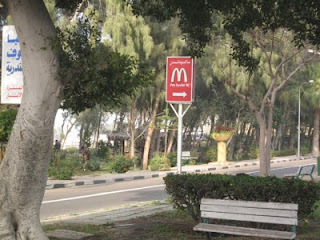 And it has become part of an Egyptian chain, Abou El Sid. In reality, the food is likely a lot better than Pastroudis served in its final years. And the dark wood paneling? It's still there too. The weather was perfect for lunch outside. The service was superb. So, since imagination is the key to writing fiction; just let your mind take you back to 1938 at Pastroudis.